Knoll's reputation for design integrity has a long and decorated history under the guiding principle: "good design is good business." For over 75 years, Knoll has created mid-century modern furnishings that inspire, evolve and endure. Take advantage of significant savings and choose from hundreds of fabrics and finishes to make these iconic pieces your own. The Eero Saarinen Collection - including the Saarinen Pedestal Tables, Tulip Chairs, Saarinen Executive Chairs and, of course, The Womb Chair. Designed by Eero Saarinen in 1957, the Tulip Chair is available with arms (as shown) or without arms. The dining and coffee pedestal tables are as popular as ever! The Mies van der Rohe Collection - including the Barcelona Chair, Table, Couch and Stool as well as the Brno Chairs, originally designed for the Villa Tugendhat. The Knoll Mies Van Der Rohe Barcelona Lounge Chair, designed in 1929, is produced to Mies' original specifications and stamped with his signature. 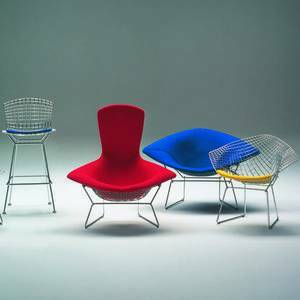 The Harry Bertoia Collection - the entire Harry Bertoia Collection, including the iconic Diamond Chair, the Bird Chair and the Bertoia Side Chair. Part of Harry Bertoia's exceptionally artistic 1952 seating collection sculpted from bent metal rods, the Bertoia Bird High Back Chair enhances virtually any environment. The Florence Knoll Collection - including her eponymous Lounge Collection, Credenzas, and Tables. Designed in 1954 by Florence Knoll, this collection is available in many of the Knoll Textile collection fabrics. The Warren Platner Collection - including the Platner Lounge Chair, Arm Chair and Dining Table. In the 1960s, Warren Platner transformed steel wire into a sculptural furniture collection, creating what is now considered a design icon of the modern era. The Richard Schultz Collection - including the 1966 Collection and the Petal Table Collection. The Petal Table is available in vertical grain natural teak and white HPDE (High Density Polyurethane). It is available as a coffee table, a dining table and an end table. The Marcel Breuer Collection - including the iconic Wassily Chair and Laccio Tables. Marcel Breuer was an apprentice at the Bauhaus in 1925 when he conceived the first tubular steel chair, the Wassily Chair, based on the tubed frame of a bicycle. The Jens Risom Collection - including the iconic web-backed Side and Lounge Chairs. Jens Risom's original 1941 collection for Knoll incorporates a natural aesthetic characteristic of understated Scandinavian design. The George Nakashima Collection - including the Straight Chair and Splay Leg Table. Originally designed for Knoll in the 1940s, the Straight Chair by George Nakashima is a Modernist take on the traditional Windsor chair. Featuring natural, low-sheen finishes and live wood grain patterns, the Straight Chair epitomizes Nakashima and his craft. The Charles Pollock Collection - including the Pollock Executive Chair and the newly reintroduced Pollock Model 657 Arm Chair or Sling Lounge Chair. Charles Pollock's 1963 executive chair and the Model 657 Arm Chair or Sling Chair exemplify Pollock's honest approach to design. Knoll invests in extensive research, field studies, customer collaborations and partners with experts from the fields of architecture, organizational behavior, technology and business management to ensure that its products adapt and respond to the evolving needs of their customers. Environmental needs and requirements are not overlooked by Knoll either. Knoll is considered a leader in production practices that reduce waste, conserve natural resources and protect the biosphere. This entry was posted in Uncategorized, Events & Showcases, Seating & Chairs, Design & Decorating, Living & Rec Room, Kitchen & Dining, Garden & Outdoor, Sales and Promotions and tagged Barcelona Chair, Knoll, Mies Van Der Rohe, Tulip Chair, bird chair, harry bertoia, warren platner, knoll classics sale, eero saarinen, florence knoll, jens risom, marcel breuer, petal table, richard schultz, Florence Knoll Lounge Collection, Platner Seating Collection, Wassily Chair, George Nakashima, Straight Chair, Charles Pollock, Pollock Executive Chair, Model 657 Arm Chair on February 20, 2015 by Christine Toller. The ultimate use of the Bocci 28 Series Random Chandelier Light! Omer Arbel is the creative director of the manufacturing and design company, Bocci, that produces cast glass lighting features. Cast glass is an organic process, imperfect by nature and each piece is hand made to the client’s specifications. Bocci is now featured in buildings and homes worldwide and has won several high profile international design awards. The Bocci 14 Series is a seamed cast glass sphere with a frosted cylindrical void that houses either a low voltage (12V, 10W) or LED (12V, 1.5W) lamp. Individual pendants are visually quite subtle, but gain tremendous strength when multiplied and clustered in large groups. In Vancouver the studio is housed in a building the size of a two-car garage and employs three shifts of glass blowers around the clock. Click here to watch several Bocci videos on the making of their glass lighting and other products. Inspired by the sporadic, perhaps discordant arrangement of barnacles on a rock surface, the 21 Series is fabricated from thin sheets of porcelain wrapped around frosted glass trumpet-shaped diffusers. The Bocci 21 Pendant Lighting Series is available in lengths of 10' to 100'. The emotional qualities inherent in light and the intrinsic quality of the materials Bocci uses transform interior spaces, altering the mood and becoming active, sculptural works of art. The Bocci 28 Series is unique in that designer, Omer Arbel, chose to develop a method of production that inherently makes each piece different from the next. Many colour options available. It is available in halogen and LED. The 28 Series can be configured many ways. Bocci and the GR Shop team offer complete design resources to help you choose best for your space. This entry was posted in Uncategorized, Design & Decorating, Lighting & Lamps, Architecture & Buildings and tagged Bocci, Omer Arbel, Bocci 14, Bocci 28, Bocci 21 on February 12, 2015 by Christine Toller. The literary spaces in your life - showcase your interests! February is love of reading month and there's no better time to cozy up with a book, or ten. It is also a good time of year to take a good look at how to house your literary collection. Bookcases, and all things book related, don’t have to be boring. Here are some storage ideas and book accessories to help you browse your titles easily and keep your rooms clean and free of clutter. The Kartell Bookworm Bookcase, designed by Ron Arad, uses extrusion technology to create of a curvy bookcase which assumes any desired shape, without compromising toughness and functionality. Unlimited shapes can be formed. 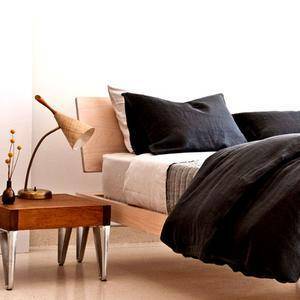 It is available in 5 colours and 3 lengths. The Carl Hansen Mogens Koch Bookcase system with its square bookcase units offers almost endless flexibility with countless elements. Characteristic of both the design and the craftsmanship are the beautiful dovetail and rabbet joints, which create strength and stability in each module. The bookcase can be hung on a wall or placed on a plinth. The design for Vitra's Kast Modular Storage Unit (2005), which Maarten Van Severen worked on during the last few months of his life, offers flexibility and adds some fun colours to your room. The Vitra Kast Modular Storage system is available in 3 heights and the sliding door colours are fresh and optimistic. Designed by Charles and Ray Eames for Herman Miller in 1950, this set of storage units can be configured many ways. The steel cross-supports and uprights give the units an industrial feel and the dimpled plywood on the cabinet fronts and plywood drawer fronts and shelves reinforce the furniture's mid-century modern appearance. If you are looking for accessories to hold your books and organize your papers, some bookends might be the answer. Tom Dixon's Fossil Bookends are made from 100 million year old fossilized wood. They have a rough exterior and each set is unique. They are lovely and heavy and will hold the largest of tomes. And then there is this wall unit from Vitra that won't hold your books but it does hold everything else! The Vitra Design Museum produces the Uten.Silo Wall Unit designed by Dorothee Becker in 1969. It is available in 2 sizes and 3 colours. With containers of different shapes and sizes, metal hooks and clips, Uten.Silo brings order to offices, kitchens, workshops, bathrooms and children's rooms. So even if it feels like those crazy groundhogs have it all wrong and spring is a long way off, you will have a cozy, organized, stylish space to hang out in and read, if you like. This entry was posted in Uncategorized, Design & Decorating, Accents & Accessories, Storage & Shelving, Books & Literature and tagged Kartell Bookworm Bookcase, Carl Hansen Mogens Bookcase, Vitra Kast Modular Storage Unit, Herman Miller Eames Storage Unit, Tom Dixon Fossil Bookends, Vitra Uten.Silo on February 3, 2015 by Christine Toller.